Monymusk is a planned village in Aberdeenshire, Scotland. In 1170 a community of Augustinian canons was established here by Gilchrist, Earl of Mar, on the site of an earlier Celtic foundation. This was said to have been established by Malcolm Canmore in 1078 while on a military mission against the rebels of Moray. The present church of St Mary's dates from the late 12th-early 13th Century and contains monuments to successive Grant lairds as well as a Pictish symbol stone known as the Monymusk Stone. Sir Archibald Grant of Monymusk replaced the old Kirkton of Monymusk in the 18th century with a planned village designed for estate workers and craftsmen. It was almost entirely rebuilt in 1840. 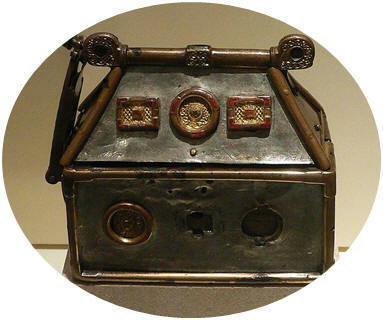 The Monymusk Reliquary (shown above) is an eighth century Scottish reliquary made of wood and metal characterized by a Hiberno-Saxon fusion of Gaelic and Pictish design and Anglo-Saxon metalworking, probably by Ionan monks. Believed to be the Brecbennoch of St. Columba, a sacred battle ensign of the Scottish army, it was used for saintly assistance by Scots in battle. It was significant because it was said to have contained a bone, or bones, of Columba. It may have been handed to the abbot of Arbroath Abbey during the reign of William I (r. 1165 - 1214), who in turn passed it to someone else's care at Forglen. The custodian was charged with the care of the reliquary, so that it could be used for saintly assistance by the Scots in battle. It was carried by the Gaelic army who were victorious against the army of king Edward II of England at the Battle of Bannockburn (1314). It stayed at Forglen until the sixteenth century, when both Forglen and Monymusk came into the hands of the Forbes family. In 1712 it was transferred to Sir Francis Grant of Cullen. It stayed in the Grant collection until 1933, when it was acquired by the people. It is now in the care of the Museum of Scotland, where it is arguably the most important piece in the Museum's entire collection.